I always give credit where credit is due so I will admit that I stole this post from Fran. She’s right when she says that in the talk shows’ credits they always have “transportation for guests provided by Fast Eddie’s Limo Service…” or someone like that. So I decided the official transportation of Linda’s Yoga Journey is the always lovely AUTORICKSHAW! Exactly two months from today I will be back home in Ma India in Chennai which is in Tamil Nadu in South India. 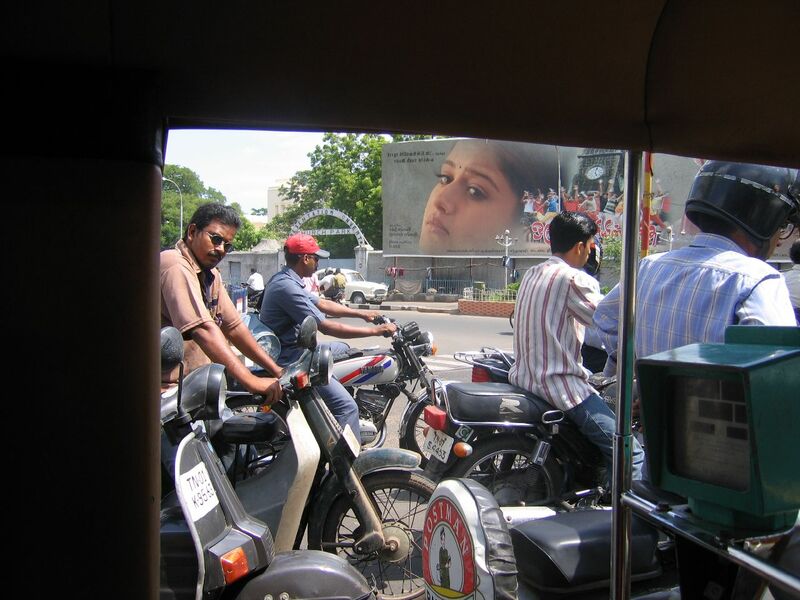 One of the things I love about Chennai is the traffic — yes, really! — because I’ve realized that it operates on Chaos Theory. It took me about two days during my first trip to figure out how the chicken crosses an Indian road — basically you walk into it, because if you hesitate, you’ll really screw things up. Or you sneak into a crowd of people on a street corner and walk with them in relative safety in one fast moving glob of humanity, the idea being that if you’re surrounded by people, chances are someone else will get hit by a bus. And if you are a really lucky, the bus will stop. Hopefully not on top of you. The video below was shot in Hyderabad, but it’s close enough to show you what Chennai’s traffic is like. Actually it has less traffic than on a typical Chennai street. Watch it and you’ll see lots of ‘ricks…THE OFFICIAL TRANSPORT OF LINDA’S YOGA JOURNEY! I’ve only been in one minor accident while riding in a ‘rick, have run out of petrol once, and have only seen a few roll over, so don’t worry — we’ll get you where you want to go…eventually. Just sit back and relax! Previous Post elvis does yoga! That is great! 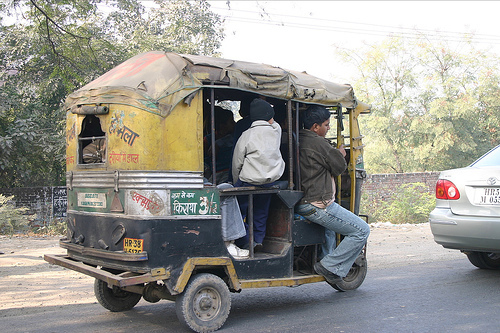 I have my bus, you have your rickshaw, it is all good!I am vicariously going to enjoy India via you dear Linda!And thank you always for your insightful, funny, smart comments on my blog.Namaste my friend! Shanti. Linda,This is a scary sight to a chicken sh*t American! I’m not sure why the dotted line is painted down the middle of the street when it is totally disregarded!I suppose if I actually went, I would manage to step into the richness of the experience. No crosswalks, eh? seeing your blog makes me itch to finalize my plans for India ’08. can’t wait to read some of your archives. I am planning to hit Kerala for 12/28-1/3 or so, and was wondering what are your must-sees and where you’ll be practicing yoga? Will be there with 2 other women. thanks and blessings- Jai Ma! Girl, that’s some nutso photography! Took me a minute to realize I might be watching A Photographer’s End. YIKES!! gartenfische…crosswalks?!? surely you jest! I believe the dotted line is just for artistic effect. hey, people are constantly beeping their horns in india, too, and no one pays attention to those either! 🙂tina, sorry, can’t help you with kerala info. when I’m there in January, after you, that will be my first time in kerala. I always start out in Chennai.